This is one valuable lesson I learned earlier in my life. Have you ever been surprised by someone who has an amazing talent that you never thought he/she would have? It came to a such surprise that you couldn’t believe your eyes? I was in middle school, provably 8th grade. There was an interesting girl in my class. Her name was Mi-gyoung. So quiet and shy, she hardly ever talk to anyone. She was an all-A student in every academic subjects. Wearing a thick glasses with messy hair, she looked just like one of those nerdy-smarty kid in many movies. She was always alone. Many, including myself, thought she was a boring person. But, one incident changed everything. One sunny autumn day, we had a school-wide picnic at the near mountain. Everyone brought Kimbap as their lunch (Kimbap is the official picnic food in Korea). We sat together on the grass and ate our lovely Kimbap that our mothers made early in the morning, enjoying each others company. Mi-gyoung ate her lunch by herself sitting away from us. After lunch, it was the talent show time. Some girls did singing, some did dancing or cracked some jokes. But nothing was more eye opening than when Mi-gyoung suddenly raised her hand and volunteered(?) to share her talent. Her request was granted by the teachers and she came up to the center stage on the grass. She pulled out a cassette tape, a hat, and a glove from her backpack. She removed her eyeglasses and put a cassette tape in a boom box that someone brought (FYI, I grow up in a boom box generation in the 80th). There was a song, “Billy Jean”‘ by Michael Jackson. She started dancing. The moon walk, the crotch holding motion, the facial expression w/ lip sync…, she did everything just like MJ…, even better. We were all shocked, even the teachers. That thick glass wearing shy girl was dancing like a pro. Who knew that she had so much passion inside of her? I think of Mi-gyoung many times especially when I make Kimbap; the food we had the day when she showed her real side. I realized that day that one can never judge or underestimate potential of the others. 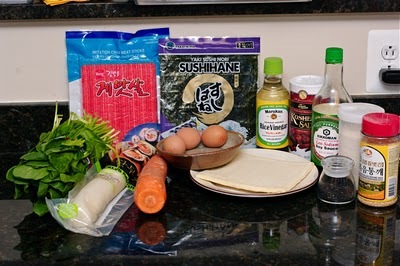 I am going to share my mother’s Kimbap recipe for that memory. Her Kimbap taste different than most other Korean Kimbap. She adapted Japanese sushi rice method. You will see what I mean by looking through the tutorial. First, rice! Short grain rice, of course. Rinse several times until you get clear water. You will need a little less water than usual. 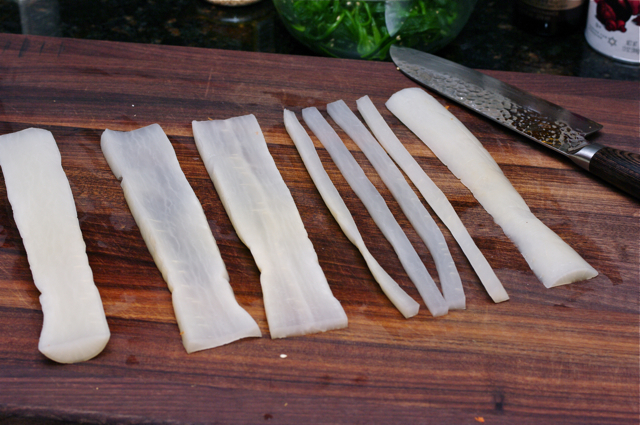 Add dried sea kelp (kombu) and let them soak in the water for 30 minutes. Remove the sea kelp when the rice start to initial boil. You can use rice cooker but I like to use cast iron pot. 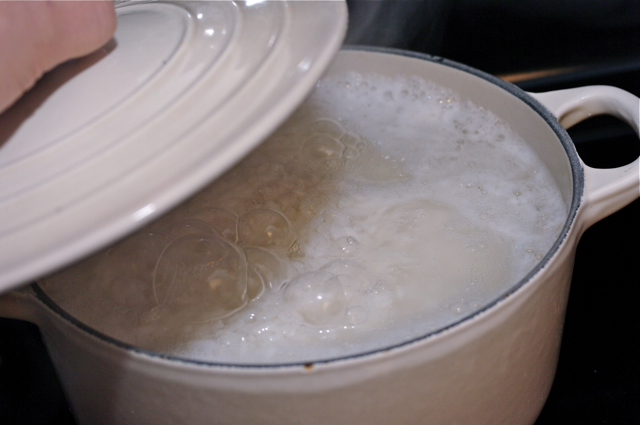 When the rice starts boil reduce heat to low and cover with a heavy lid, simmer for 10 minutes, turn off the heat and let it sit for 15 more minutes. The steam in the pot will do the marvelous job cooking. Meanwhile prepare the vinegar mixture by mixing 1/3 cup rice vinegar, 4 Tbsp sugar, and 1 tsp salt. Make sure all the sugar and salt have dissolved in vinegar. While rice is still hot pour the vinegar mixture to the rice in a big bowl. Wooden bowl is the best if you have. Do not mix harshly. You don’t want to smash them. Just use cutting motion with tip of the rice scoop. I added some sesame seeds. Toss them gently. The rice is done, cover with damp towel and let them cool completely. Meanwhile get the filling ready. I invited 6 guys to be my guests. Spinach, imitation crab, pickled radish, carrot, eggs, fish cakes. For the seaweed, choose plain roasted seaweeds without any flavor added. 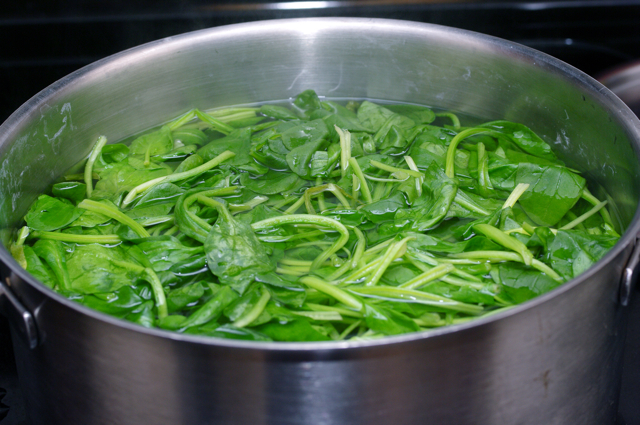 Blanch the spinach in boiling water, drain and squeeze out excess water. Season with salt and sesame oil, set aside. Cut your beautiful carrots into 3/8″ thick strips. Steam them until nice and tender, about 5-7 minutes. Fry eggs and slice into strips as well. This is fish cake. 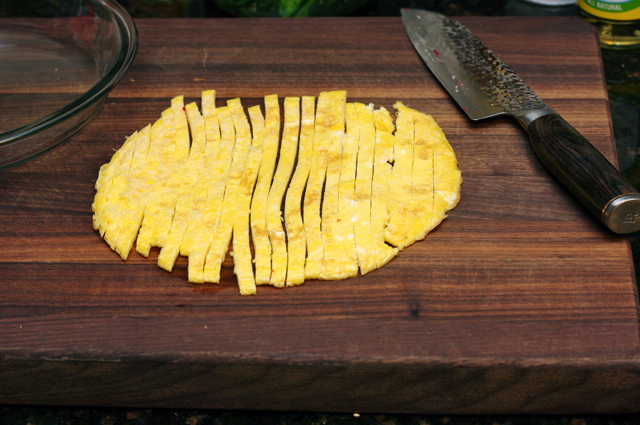 slice into 3/8″ strips. Fry them with some soy sauce and sugar. Slice the pickled radish the same way you did with carrot. Make sure you rinse the radish out of package before slicing. Slice imitation crab meats into similar sized strips as well. Place everything in a large plate for easy access. 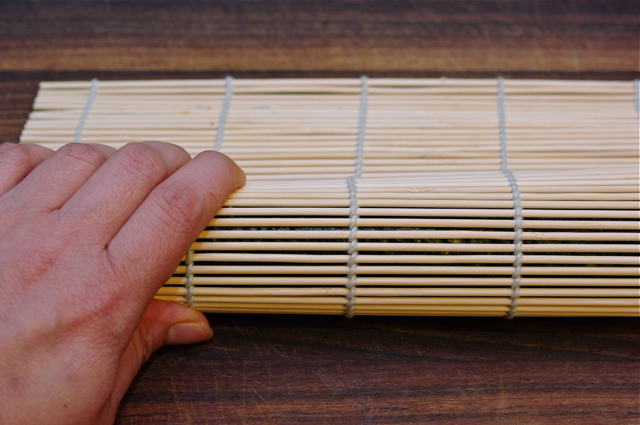 You also must have a bamboo roll. Get a bowl of water near you. Why? In case you get thirsty…, just kidding! Your finger will need water. Place a piece of seaweed shiny side down, longer side toward you. Put about 2/3 cup of rice spreading evenly covering about 2/3 of seaweed. 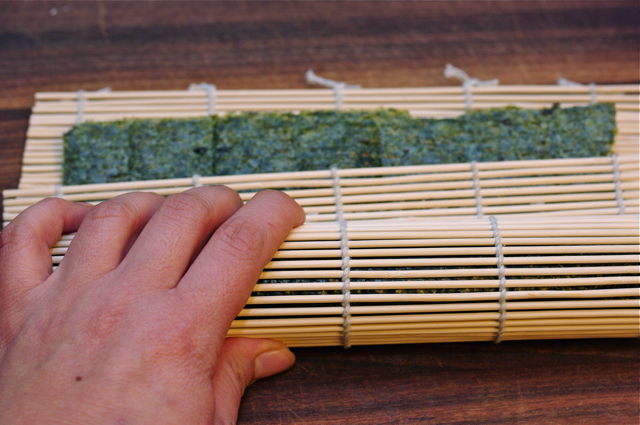 You will want to dip your finger as you do this job so the rice won’t stick on you. But limit the dipping to a minimum. Now build your kingdom, artistically! Leave about 1″ at front edge and 2″ in the back of rice. The fun part has began! 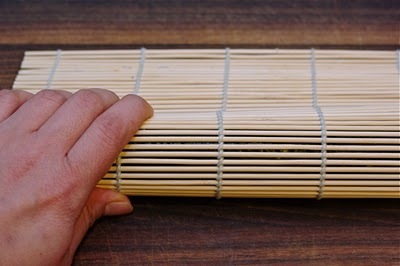 Lift up the front side of bamboo roll and carefully roll over the filling to cover, tightly pressing down the edge with your fingers. This will secure the fillings to be in place. 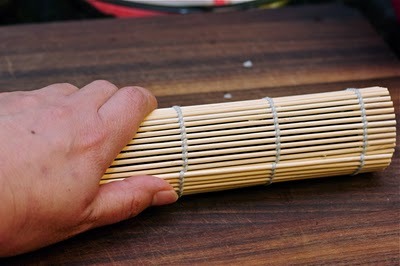 Pull the front side of bamboo roll away from you with right hand a little by little, tightening with your left fingers as you rolling. At the end, wrap it around and gently squeeze to secure. Unwrap! Ta-da! I call this “black beauty”. Now give yourself a good moonwalk at this point. 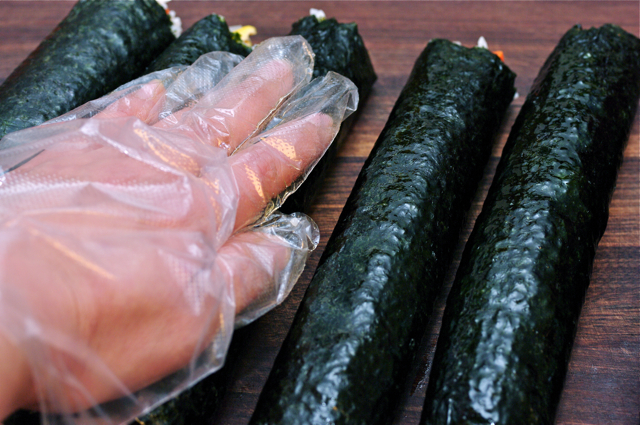 Drizzle sesame oil on your hand and rub around the surface of the Kimbap. This will add shine and glory to these guys! Slice each Kimbap into whatever size you desire. Put the whole slice in your mouth and savor all the flavor mingling on your tongue. And sing along the song of my choice, even better if you can moonwalk. Wherever you are…, my dear friend. 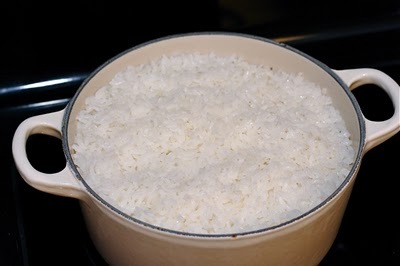 Rinse rice several times until you get the clear water. Drain and add given amount of water and sea kelp, let it soak for 30 minutes. 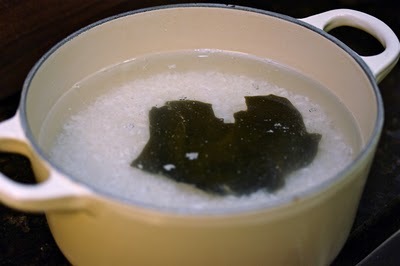 Remove the sea kelp and cook the rice in a rice cooker. 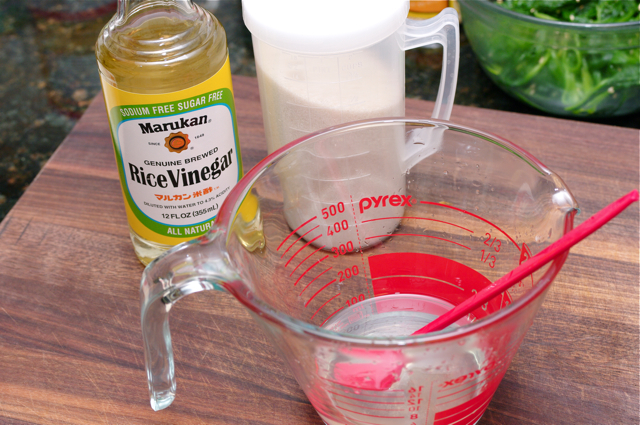 In a small mixing bowl whisk rice vinegar, sugar and salt until sugar and and salt dissolve completely. When the rice is ready, transfer into large wooden or glass bowl, add the vinegar mixture and toss thoroughly together with cutting motion. Do not smash the rice. Sprinkle sesame seeds if you like. 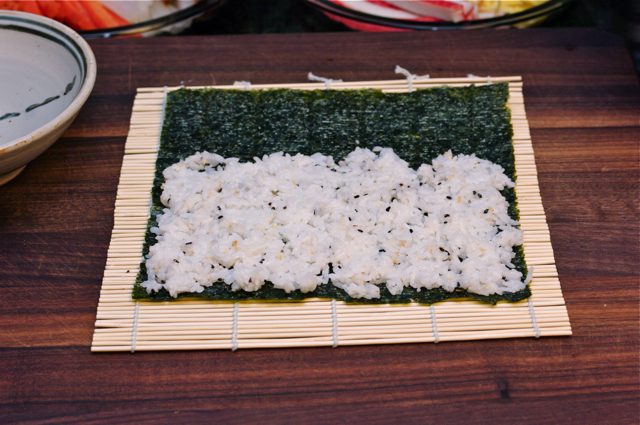 Cover the rice with damp towel and set aside to cool. 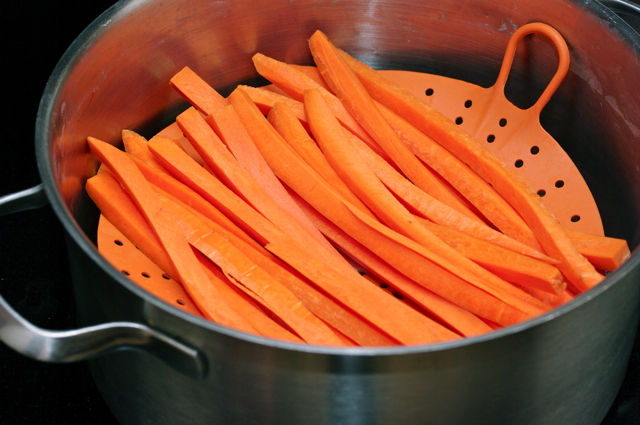 Steam the carrot strips until soft, about 3-5 minutes. Fry the beaten eggs in a skillet with a little oil. Cut into 3/8" strips. 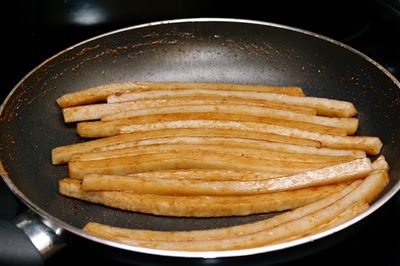 Fry the fish cake strips with soy sauce and sugar for 2 minutes. 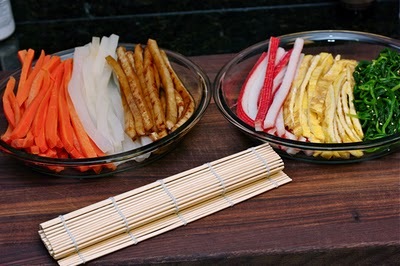 Cut pickled radish into strips. Season the blanched spinach with a little salt and sesame oil. Cut the imitation crab meat into strips. Prepare a bowl with water on the side. Spread a sheet of seaweed over the bamboo sushi roll, put about 1/2 cup or more of seasoned rice and spread evenly over about 2/3 of seaweed. You want to dip your fingers in the water so the rice won't stick. Minimize the dipping if possible. Place the fillings one at a time over the rice toward you leaving 1" in the front and 2" in the back of rice. 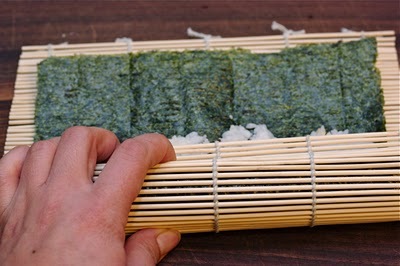 Lift up the front side of seaweed and carefully and quickly roll over the filling to cover the fillings. Gently squeeze the edge over the bamboo roll. 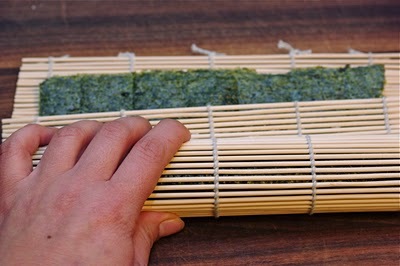 Lift up the edge of bamboo roll and pull away from you to roll up the seaweed a little by little and squeeze the edges as you roll. 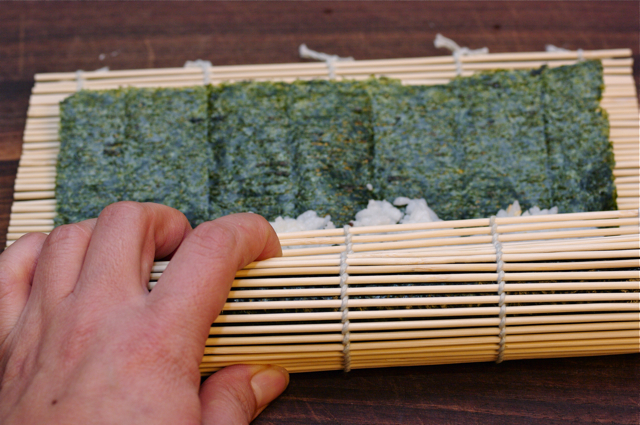 AT the end wrap the entire seaweed roll with bamboo roll and gently squeeze to secure. 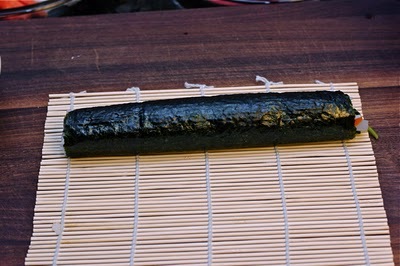 When all the seaweed rolls are completed into logs, put a little bit of sesame oil on your palm and rub the surface of the seaweed logs. Ths will gives nice shine yet protect them from getting dry. Slice the each logs about 1/2" thick slices and enjoy the fruit of your labor. Oh, this is bringing back so many lunchtime memories! I'm half-Korean and grew up in the States, and sometimes my mom would pack kimbap for my lunch, which I loved, except when some other kids teased me for my "weird" food! kimbap always reminds me of being a kid. we always had it for road trips and picnics too, i really should make some! I like how you are so precise with your step-by-step food pics (never would have thought about cooking rice in a cast iron pot), but that memory about Mi-gyoung is too precious! You're not only a fantastic cook, but also a great storyteller. Your kimbap looks so mouthwatering...! 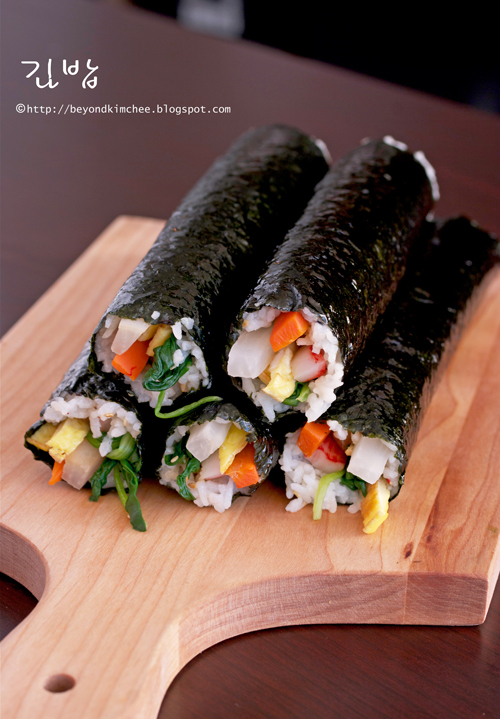 Everytime I a visit a blog and somebody makes kimbap or sushi, I always think, 'I need to make this tomorrow!' ;). The story of that old classmate of yours is so funny, but often quiet people have got surprising talents. And the surprise is often doubled, because they tend to be so introvert and quiet ;). Hope you can make Kimbap soon. Yes, I agree that the surprise is doubled because it exceeds the expectation you had. Thanks. I'm so excited to try this recipe. It looks delicious and it's one of my favorite things! Is there a dipping sauce you usually make with it? I don't use dipping sauce. It is just good to eat without it. However, I often make simple miso soup to go with though. ohh, this brings me back to my days living in seoul! i miss kimbap! I have a question. I live in Cairo now, and their rice is short grain so I think it will be fine...IF I can't find (or afford at the expensive import stores) rice vinegar, what do I do??? is milder than the other kinds. Hope you enjoy your stay in Egypt. Wow. Looks fabulous, I am going to give this a try. Hi there! I made this recipe the other day and now I've been asked to repeat it again, but for double the people! Can you simply double the rice and vinegar portions? Or should it be to some other ratio? thanks! Yes. 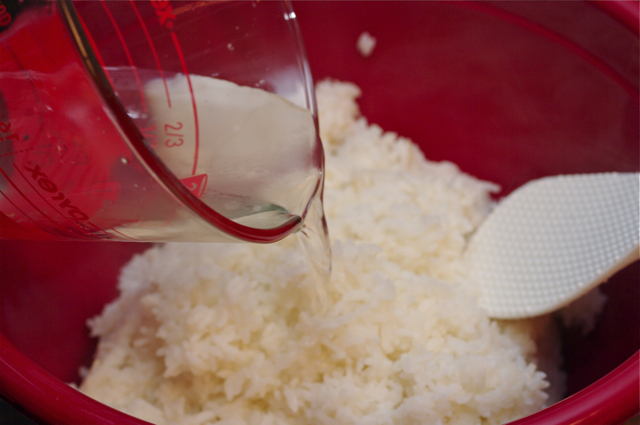 If you are doubling the amount of rice, you can double the vinegar seasoning mixture as well. You've must made them very well last time. They like to put you to work! Have fun making them! Yum I love whenever my mom makes this! Hopefully I can make it for myself now. Wow, this looks delicious. I must try it sometime soon. I love sushi of all forms and although there is no raw fish here, it looks delicious. I am not sure where I would find the fish cake, but I am sure I can substitute. May I ask, why must we put kelp into the rice in water? 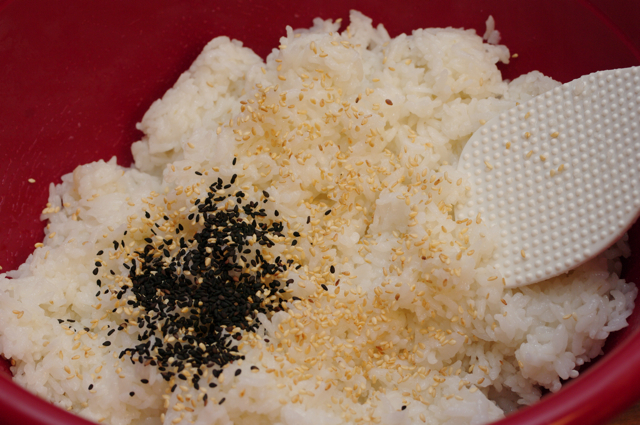 Hi, the rice seasoning in this kimbap recipe is closed to the Japanese sushi rice which my family often use. Sea kelp adds nice flavor. You can omit the kelp if you prefer without it. Our family loves making and eating kimbap! We play around with the fillings - sometimes adding different things like avocado, cucumber or kimchee. But I don't like that there is saccharine in the pickled radish. 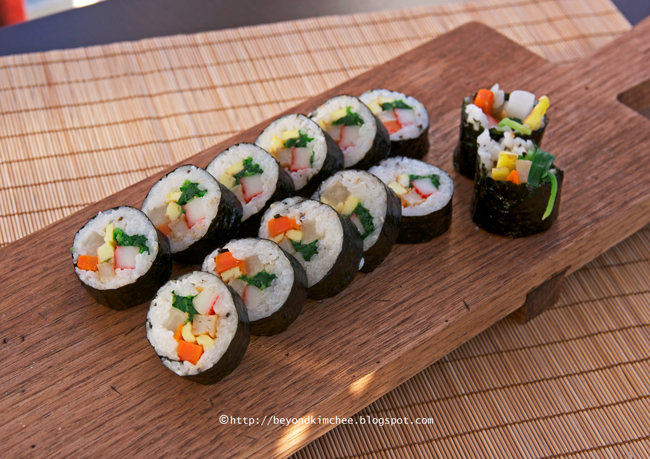 The radish is really an essential flavor that is needed and the kimbap tastes bland without it. So my question: is there a way to make the pickled radish at home, so that I can keep the saccharine out? Also - I loved your story about your childhood friend. Now everytime I make kimbap for my daughter's lunch I hum Billy Jean to myself and smile! Hi Linda Yes, you can make pickled radish at home. 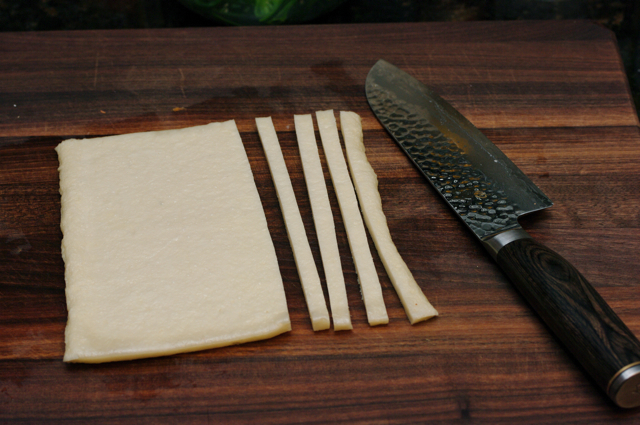 Get a Korean or daikon radish and and slice into long strips (the size you desire for making kimbap). Sprinkle 1/4 cup of coarse salt per radish and let it soak for 1 hour. Drain the liquid that has been extracted from the radish. In a pot combine 1 cup vinegar + 1/2 cup water + 1/4 cup sugar together and bring to a boil stirring to dissolve the salt. Remove from heat and pour over the radish. Let it sit in the room temperature for 4 hours, then keep in the fridge for 3-4 days and your radish will be ready to serve. Store them in the fridge for as long as you want. It is nice that your family enjoy making Kimbap. It is a great family activity, isn't it? Hi! I loved reading this post! Thank you! Great stories that made me laugh! I was inspired to make Kimbap and blogged about it at http://foodflavorfascination.wordpress.com/2012/10/19/black-beauty-kim-bap/ I love how you called the Kimbap "Black Beauty." It reminded me of some memories. I'll have to try making the pickled radish too. Thanks Samantha. You did a great job with your kimbap.I enjoyed reading your post. I love your recipe.. And i really enjoy your story. I made these for my family and they turned out great! Thank you for this recipe! How would the rice cooking change if I want to use brown short grain rice instead? Wow!! you my friend are just simply AMAZING!! I love the humor you bring to the table so to speak =) I just wanted to say that the recipe you have listed is the best one I have came across so far *and my search is done now since I found you* Thank-you for being so awesome! 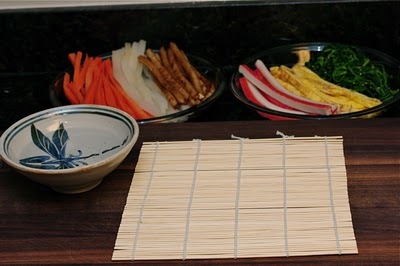 How to keep the rice rolls fresh if made them a day before? Thanks. You can't. You need to consume on the day you made. They don't keep well in the fridge. I realy like your blog. This is the first time I see this blog. 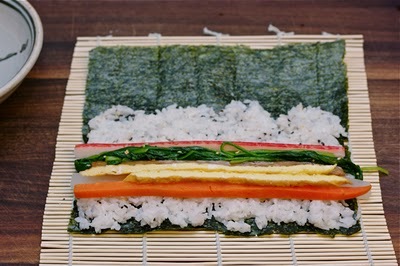 Yes, i like the way you show how to roll the kimbap. Thank you for sharing. Thank you so much for your blog! 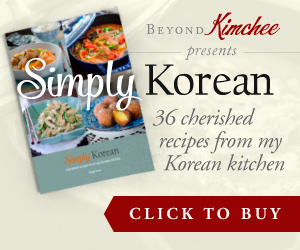 My husband is half Korean, and my mother-in-law has taught me to cook a lot of Korean food. 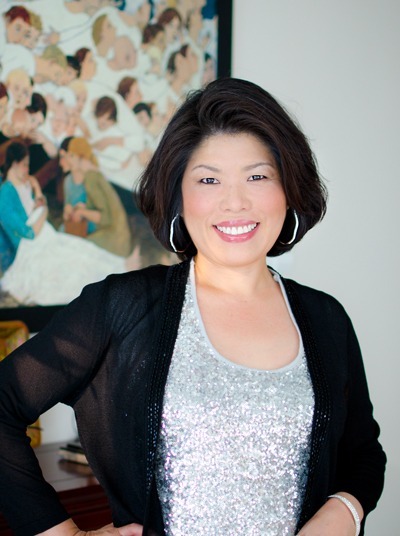 Your recipes are authentic and delicious :) My mother-in-law doesn't have her recipes written down, and whenever I refer to this blog when I have a question, it turns out just like hers! YAY! Thank you! Do you have a recipe for kongnamul soup? I posted Beef and Bean Sprout Soup yesterday. Hope you get to try it. There are may versions of Kongnamul soup. I will remember to post as much as I can. I have all the ingredients, and I'm excited to get started, however, all I could find was prefried fish cakes, do I still prepare it as suggested? Or do I just reheat them? Thanks for your help. Hi Michelle You can prepare it with the recipe to add more flavor or you can use as is. Usually it tastes better if you add the seasoning to the fish cakes. Have fun making them. They will be delicious! is it absolutely required to use rice vinegar? You can use white vinegar instead.